Balancing contemporary fashion trends with environmental safety regulations, a wide assortment of Designer Jute Bags have become the hot selling stuff in the market. These Designer Jute Bags have attracted a larger slot of customers creating a considerable demand, which has triggered the interest of the manufacturers to come up with some thing better and innovative. Consequently, a complete new array of jute bags have hit the market; these eco friendly bags are complete contrast to the earlier collection of jute bags. Designer Jute Bags are identified with salient features like strength, exclusive designs and good capacity, variety of colors, etc. 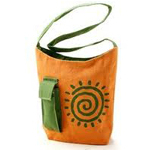 Further, the designs are highly versatile like woven designs, hanging bags with long belts, etc. These designer jute bags can be used as ladies purse, shopping bags, lunch box carrier, and so forth. Also, these bags are often interwoven with other material like plastic, fabric, laces, velvet to design more charismatic range. 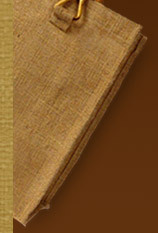 These bags are often hand made, which enhances the detailing in the designing work. Also, these bags are available at different patterns, which can be customized as per the personalized choices of customers. Owing to the variety of designs and patterns of Jute Bags have got wide acceptance among the college and office going individuals. In the market, one can get a collection ranging from trendy to classic patterns complementing the specific choices of the customers. Besides, these bags are also gaining popularity as a perfect corporate gift item, given away during festivals and other such occasions. As per the requirements of the corporate houses, they can customize the bags with their logos and attractive messages. Moreover, jute bags are easy to clean and can be washed at home. Economically priced, durable and stylish, Designer Jute bags are ideal options to cling up the drive for environment safety.